On Meet the Press today, Nader made nice sounds about John Edwards. I wish Russert had asked the obvious follow-up. "Will you still run if Edwards were the Democratic nominee?" ESF is an RSS 2.0 extension for sharing event information. Thanks to Greg Reinacker for the pointer. Britain joins Denmark and Germany in blessing RSS as a standard format. You can see the endorsement in Table 4 in this PDF document. I started a new category for the Nader campaign, and of course it has its own RSS feed. If someone wanted to start a group blog about the Nader candidacy, this would be a decent place to start. CSM: Will Google IPO bring back the bubble? Oy. There is no such thing as a good date for a conference. We've tentatively chosen April 10 for BloggerCon II, and why didn't anyone notice that the next day is Easter Sunday? And Passover is April 5th through the 13th. I'm not changing the date, but I am re-opening the discussion. Imho, Nader's run separates the people who "get" American democracy, and those who don't. If Nader is going to win the election for Dubya, then now's the time to fix the bug in the process. Kerry isn't nominated yet. Think. What's the problem that Nader exploits? What's so fixed about our political system that a minority independent candidate, who likely won't be able to register in many states, is going to spoil it for.. who exactly is he going to spoil it for? Think. Is this the America you imagined when you were a kid? Why can't we make it better? Why can't we have a dozen people running for President? By trying to hold back Nader (good luck) maybe you're preventing exactly the kind of transformation we need. I think Nader is a patriot. Give him a medal. And think instead of being part of the herd. Here's a thought. Who could you find to run for President who would split the Republican vote? Come on. We've got some money. Who could you launch to take votes from the people you don't like? I'm going to give some money to Nader to thank him for challenging conventional wisdom. I'll give money to a Republican. 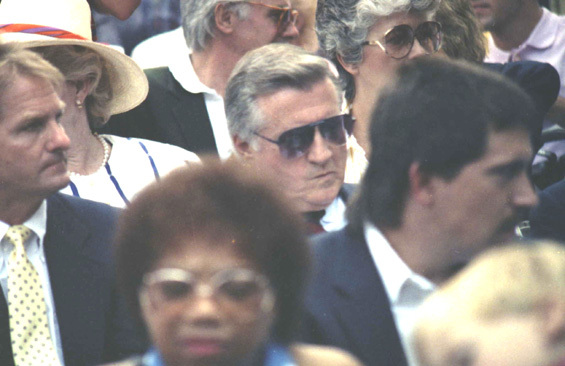 If it's good enough for George Steinbrenner (who's probably a Republican, think about it) why can't I give some money to a Republican who's strategic? William Grosso: "The number one response to Nader's entry is not about his ideas and whether they're any good. It's about how his entry impacts the (mostly imaginary) horse race." Eric J: "It's that 'two party' mentality that keeps us locked into this 'two party' nonsense." Andrew moves forward with RSSTV. I'm having a great time with the program for BloggerCon. The second one is much easier. Man. Anyway one of the themes is going to be Nuking The Echo Chamber. I'm going to ask each of the moderators to find a way to work that into the discussions they lead. These conferences are stringing out into a series. This one follows the O'Reilly Emerging Technology conf, where the they identified this problem. How do we methodically and systematically overcome the tendency for echo chambers to form and self-perpetuate. There are some obvious ideas, once we know the problem is there, which we do now, thanks to the people who were at O'Reilly. Of course our conference will be totally wide open and webcast and IRC'd, blogged and wiki'd, we'll create a record, so subsequent meetings can work on the problems we uncover and hopefully build on the answers we discover. CNN: "Ralph Nader, a consumer advocate and former Green Party presidential candidate, said Sunday he will run for president as an independent in the 2004 election." Dan Gillmor column on anonymity. NY Times: The Search Engine That Isn't a Verb, Yet. BBC: "The consumer advocate Ralph Nader has said he will announce on Sunday whether he will join the US presidential race." Nader is on Meet the Press this morning. Euroresidentes: "RSS es un formato para la sindicacion de contenidos de paginas web." Two years ago: "If I've inspired zealotry I've failed." Five years ago I was working on my browser-based weblog editor. Last update: Sunday, February 22, 2004 at 8:42 PM Eastern.